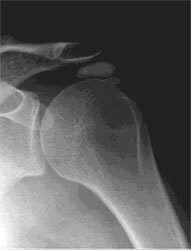 Calcific tendonitis is a build-up of calcium deposits within one or more of the four tendons that meet at the top of the shoulder joint. Together these four tendons are known as the rotator cuff. The build-up of calcium deposits leads to pressure and chemical irritation in the tendon. This can be extremely painful. The calcium deposits can also rub or irritate a small, fluid filled sac (called a bursa), located between the bone on the top of the shoulder (called an acromion), and the rotator cuff tendons. The bursa is designed to enable the smooth gliding of the rotator cuff under the acromion. When irritated or inflamed it is less able to do this and movement results in pain. We still don't know for sure why calcific tendonitis affects some people and not others. It can affect all age groups and a wide range of people who take part in a wide range of different activities. The most common symptom is pain. In addition, as calcific tendonitis can cause impingement in the shoulder joint, it can also present many of the same symptoms as subacromial impingement. This may include a painful arc of movement when the arm is lifted out to the side and up to your ear. Some people report significant pain at night, which can interrupt their sleep. Others often describe a "locking" sensation in their arm when attempting certain movements. An x-ray can provide an excellent "picture" of bones and joints and can clearly show evidence of calcific deposits. An ultrasound uses high frequency sound waves to produce images of the body. The procedure is painless and is particularly good at providing images of any calcific build up from angles that would be harder to achieve with an an x-ray. An individual programme of exercises will be devised for you. These may include exercises to strengthen the muscles around your shoulder blade, improve your posture, strengthen your rotator cuff and improve stretching. Although the exercises may at times be hard work, tight or uncomfortable, they should not be painful. Should you need any other form of treatment, such as injections or surgery; physiotherapy will form an important part of your rehabilitation and recovery. Depending on the extent and duration of your symptoms, you may benefit from a steroid injection. Steroids (such as cortisone) are good at reducing the inflammation. However, it is unlikely that you will able to have more than three steroid injections during one year. An ultrasound image is used to identify the exact area of calcification. Under ultrasound guidance and with local anaesthetic the calcific deposit can be punctured, possibly aspirated and flushed out. A steroid injection is also applied to treat the inflammation. Barbotage is completed as an outpatient, day procedure. You may be in some discomfort following it, so it is a good idea to ask someone to drive you home. You should be able to return to driving the following day though. The procedure is successful in 60-70% of patients, although some people require two treatments. If you do not respond to the barbotage, you may need surgery, although Mr. Cole will advise you of this. This is a keyhole surgery where a camera is used to help identify and target specific problem areas. A Subacromial Decompression is performed and any large calcific deposits can be removed from the tendon at the same time. This is normally completed as day surgery and is minimally invasive. Following your surgery, your team of physiotherapists will work with you to devise an exercise programme. This will be designed with advice fromMr. Cole to help you recover as quickly and efficiently as possible. guided barbotage and occasionally shock wave therapy. However if the symptoms are ongoing and painful, you may need surgery to increase the amount of space between the flat bone at the top of your shoulder (acromion) and tendons of your shoulder joint (rotator cuff). This procedure is called subacromial decompression and will prevent the painful pinching you have been experiencing. If you have a build-up of calcium in the area, Mr. Cole will clean this away (debride it) in a procedure called arthroscopic excision of calcific tendonitis, at the same time that the arthroscopic subacromial decompression is being performed. This is the least invasive type of surgery and will leave minimal scarring. Your arthroscopic excision of calcific tendonitis operation will be day surgery. This means that you won't normally have to stay overnight in hospital. However, you may feel more comfortable if you bring your own dressing gown, slippers and toiletries. The operation is carried out under a general anaesthetic. After your admission, you will be given a pre-med. This is usually in tablet or liquid form; It will help you relax before your surgery. Usually you will be given an interscalene nerve block during the operation. This acts as an excellent pain relief and for a short while after your operation your shoulder and arm may feel numb. When this wears off, your shoulder can feel more sore. You will be given some painkillers to take after the operation. When you begin to feel sensation returning to your shoulder (often a "pins and needles" feeling), you should start taking the pain medication that you have been given. Persistent pain or stiffness in or around the shoulder (5-10% of patients could still have some symptoms after the operation). You will usually be invited to attend an outpatient clinic within 2 weeks of your operation, where the wound will be examined and your dressing removed. After about 6-12 weeks you will be asked to return so that Mr. Cole can check on your progress. You may discuss any concerns you have during these appointments. Alternatively, should you have a concern, you may telephone Mr. Cole's clinic at any time following your operation. Arthroscopic excision of calcific tendonitis is completed by keyhole surgery. This means you will only have two to three small puncture wounds. You will not have any stitches, only small sticking plaster strips. Keep the wounds dry until they are healed, which is normally within five to seven days. You can wash or shower and use ice packs, but protect the wounds with waterproof dressings. These will be given to you on your discharge from hospital. Avoid using spray deodorant, talcum powder or perfumes near or on the wounds until they are well healed. The dressing will normally be removed at your first follow-up appointment.